Following our series of Bridging the Gap alums, we'd like to introduce you to previous participants of our Interdoc Scotland workshops, starting with Karen Guthrie. Karen is a freelance artist and filmmaker who came out of Edinburgh College of Art and is now working on independently generated and commissioned projects. From time to time she gives lectures and professional development workshops within educational contexts, having lectured in Fine Art extensively over the last 15 years. 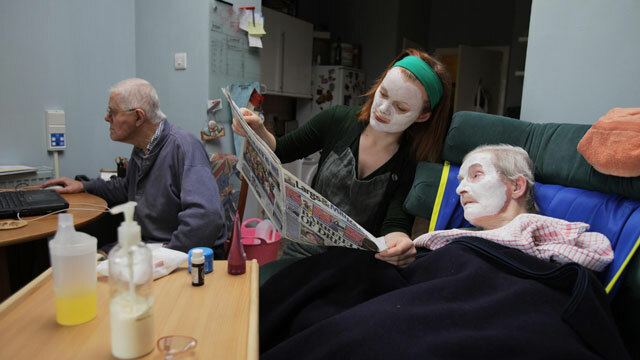 Karen’s first feature doc was co-directed with Nina Pope: Bata-ville: We are Not Afraid of the Future, a left-field road movie which premiered at the Edinburgh International Film Festival in 2005. Their latest film Jaywick Escapes, which is a portrait of the people of Britain's most deprived place premiered at Sheffield Doc/Fest in 2012. Interdoc weekend kicked off with a bit of a 'pitch' practice, which in normal people parlance is a kind of Dragon's Den approach to presenting your film's potential (visually and verbally) to some VIPs from planet-of-film – who you hope might give you a supportive smile, then a meeting and eventually some finance. In such supportive company as the Scottish Documentary Institute, this procedure isn't that stressful, but the idea is to get so good at it (without, of course, losing one's spontaneity or hair) that you could confidently pitch to a full Wembley Stadium or its documentary film equivalent, the IDFA Forum in Amsterdam. So our small band took to the pitch spot in spring when we had our first session, and caught up on how each one of our projects had come on. Some of us had filmed a lot, others had reframed their films, but – not surprisingly – we all still needed money so top marks for coming back to school to learn how. There's a powerful sense of collective support in these practice pitches, but not having to pitch publicly often, I wonder if this is the case in the cut throat forum of a 'real' pitch – or do the other teams secretly cheer when you bump the mike, your taster stalls or you go a bit blank?! Once we made it through our pitch rehearsals – the new 4 minute taster for our current project was brilliantly received – we then studied budgets in close detail (cries of "You'll need a third hard drive, so budget it in! ", and "You haven't got the rights yet? That could be expensive! ", and even "You have to budget for bribes? Oh, I see, we call them 'tips' on paper..."
We also got two Skype sessions with major European players Stefan Kloos and Peter Jäger. An example of great advice we got from them was: "Talk to your sales agent as soon as you have had the idea for your doc." It seems that the best approach is to show a sales agent a rough cut and ask them for advice regarding festivals the film should be targeting. Do not rush the release, even though as Noé from SDI rightly pointed out, most filmmakers are probably starving at this stage of production, so it may seem that they are rushing the release to make sure they don’t become bankrupt. With the consensus that piracy and the web mean there's not that much legitimate 'business' left out there for film, it seems that we filmmakers need to help distributors do their best by really planning the film’s release from festival to theatrical to VoD. Karen's project What About Dad? is an autobiographical portrait of family survival, anchored to the complicated reconciliation of a couple’s 50-year relationship despite two seismic events in their lives: a mother’s devastating stroke, and – what many would consider the ultimate marital betrayal, the fathering of a child with another woman. Unfolded from the inside of the family by their daughter Karen, it is a film about healing, loyalty, and learning to live a day at a time. 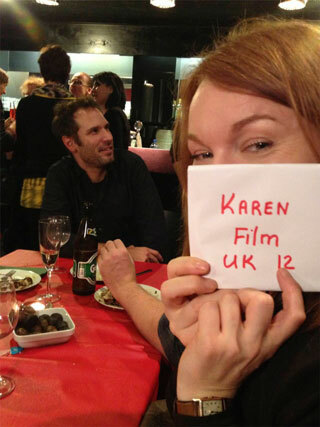 Following the first Interdoc Scotland workshop, Karen was selected to the Edinburgh Pitch in June 2012. What About Dad? was selected for the MEDIA-funded Sources2 Script Development Workshop for 2012/13. Post-production will commence this spring. Interdoc Scotland currently has an open call for applications. Deadline is Monday 25 February.